Dura clip supported shelving is the simplest and most flexible system available. 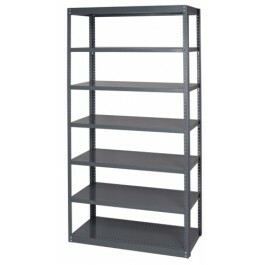 Special top and bottom shelves have 2" wide face and triple bends on all four sides. System provides maximum rigidity without bracing while allowing access from all four sides. 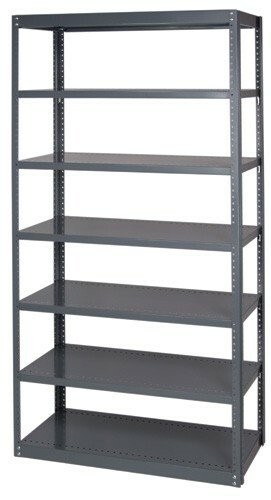 Shelves can be used to support mezzanine grading without the use of costly accessories. Each unit includes 4 posts, two 2" Dura Shelves (1 top and 1 bottom) with non-slip connection hardware, and remaining number of intermediate shelves and clips. Specially designed Tight Lock fasteners bolt securely to offset post at four points per corner, 16 points per shelf (top and bottom) to prevent unit from swaying. Closed units also include one back panel and 2 side panels. 24" x 48" x 99"